Why does everybody think it is OK to bother poor old Cozymonster with their troubles and crazy questions about the meaning of life? That's what Cozymonster would like to know. Is there an "I was born to answer all questions" sign on his forehead? Does he even have a forehead? Cozymonster would love to have some answers himself! Who invented quizzes? Who came up with taxes? Why is it that the better the taste, the worse for you it is? And vice versa. Perhaps you have the answer? If not, you and Cozymonster will get along just fine. Cozymonster is a member of the 2010 team. 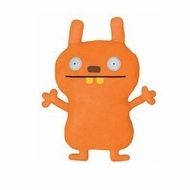 Artist created huggable plush UglyDolls are hip, huggable and not a bit ugly at all!